Perform the self-diagnoses with consult before performing the symptom diagnosis. If dtc is detected, perform the corresponding diagnosis. Perform self-diagnoses with consult before performing symptom diagnosis. If any dtc is detected, perform the corresponding diagnosis. Check that A/C indicator turns ON. Check visually and by sound that compressor operates. Check that a/c indicator turns off. Check that compressor stops. No >> perform diagnosis of вЂњcompressor does not operateвЂќ in вЂњsymptom diagnosisвЂќ. Refer to hac-102, "diagnosis procedure". Check tension of drive belt. Refer to em-16, "inspection". No >> adjust or replace drive belt depending on the inspection results. Connect recovery/recycling recharging equipment to the vehicle and perform pressure inspection with gauge. Refer to ha-18, "symptom table". No >> repair or replace parts depending on the inspection results. Check duct and nozzle, etc. Of the front air conditioning system for leakage. Check that there is not much difference between actual ambient temperature and indicated temperature on information display in combination meter. 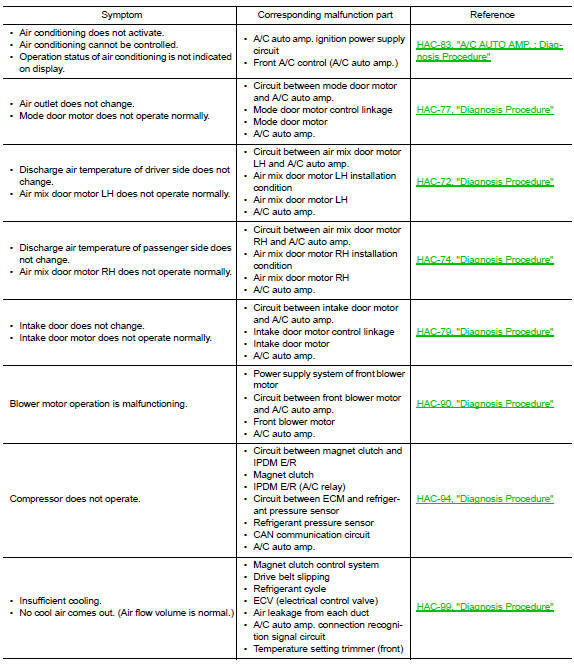 No >> perform diagnosis for the a/c auto amp. Connection recognition signal circuit. Refer to hac-63, "diagnosis procedure". Check setting value of temperature setting trimmer (front). Refer to HAC-55, "Temperature Setting Trimmer". Check that temperature setting trimmer (front) is set to вЂњ+ directionвЂќ. The control temperature can be set with the setting of the temperature setting trimmer (front). Set difference between set temperature and control temperature to вЂњ0вЂќ. Is inspection result normal? YES >> Inspection End. NO >> Replace A/C auto amp. Refer to HAC-105, "Removal and Installation". Perform self-diagnosis with consult before performing symptom diagnosis. If dtc is detected, perform the corresponding diagnosis. Check engine coolant level and check leakage. Refer to co-11, "system inspection". Check reservoir tank cap. Refer to co-11, "system inspection". Check water flow sounds of the engine coolant. Refer to co-11, "system inspection". No >> refill engine coolant and repair or replace parts depending on the inspection results. Check installation of heater hose visually or by touching. Check temperature of inlet hose and outlet hose of front heater core. Check that inlet side of heater core is hot and the outlet side is slightly lower than/almost equal to the inlet side. Always perform the temperature inspection in a short period of time because the engine coolant temperature is very hot. No >> replace heater core. Refer to ha-44, "heater core : removal and installation". Check duct and nozzle, etc. Of front air conditioning system for air leakage. Check that temperature setting trimmer (front) is set to вЂњ− directionвЂќ. The control temperature can be set by the temperature setting trimmer (front). Set difference between the set temperature and control temperature to вЂњ0вЂќ. Are the symptoms solved? Yes >> inspection end. Symptom: compressor does not operate. Perform self-diagnoses with CONSULT before performing symptom diagnosis. If DTC is detected, perform the corresponding diagnosis. Check that refrigerant system is properly charged. If refrigerant amount is below the proper amount, perform inspection of refrigerant leakage. Check magnet clutch. Refer to HAC-94, "Component Function Check". Does it operate normally? YES >> GO TO 2. Check refrigerant pressure sensor. Refer to EC-465, "Component Function Check". Check вЂњCOMP REQ SIGвЂќ and вЂњFAN REQ SIGвЂќ in вЂњDATA MONITORвЂќ mode of вЂњHVACвЂќ using CONSULT. Check вЂњAIR COND SIGвЂќ and вЂњHEATER FAN SWвЂќ in вЂњDATA MONITORвЂќ mode of вЂњECMвЂќ using CONSULT. NO >> Check CAN communication system. Refer to LAN-16, "Trouble Diagnosis Flow Chart". Check вЂњAC COMP REQвЂќ in вЂњDATA MONITORвЂќ mode of вЂњIPDM E/RвЂќ using CONSULT.